It’s DFS tournament season and everybody wants in on the fantasy football action in Week 14. Whether you’re about to join the Millionaire Maker or a single-entry tournament, it’s important to consider the stacking strategy. Just like any strategy option in DFS, there are multiple ways to grab value from stacking. You can pay up for your stack and find two of the highest-scoring players in all of DFS that week. Sometimes, you can even find two of the highest scorers without paying up and instead finding value in the middle range. And of course, you can win using my favorite strategy — bargain stacks that allow you to find game-winners in the rest of your lineup. 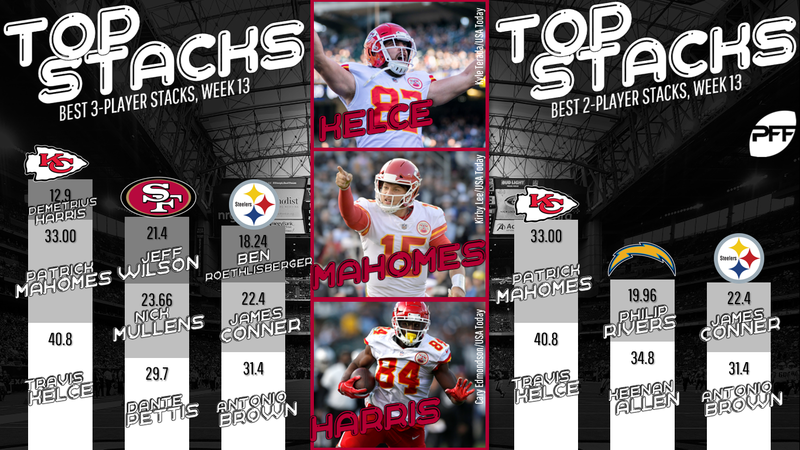 Every week we’ll break down all of my favorite stacks overall and make the case for why you should be using them in your DFS tournament and cash games. These stacks are not specific to FanDuel or DraftKings unless signified in the writeup. Although it requires you to take a stroll down narrative street, buying into an offensive playcaller change for Rodgers makes sense when you’ve watched the slants-flats Mike McCarthy offense for so long (Giants fans who dealt with Ben McAdoo can attest). In his first week with a new voice, Rodgers gets to match up against a defense that has allowed the second-most fantasy points to quarterbacks. Jones gets the boost from a new voice who is likely to increase his workload and scale back the workload of Green Bay’s more inefficient option — Jamaal Williams. Adams continues to be Rodgers’ go-to wide receiver in all areas of the field, but specifically in the red zone, and he is worth the hefty price tag in this matchup.